The Front Street Watts Crips (FSW) are an African-American street gang located on the East Side in the Watts section of South Los Angeles, California. Their neighborhood spread from Central Ave to Avalon Blvd, between 103rd Street to 108th street. The Front Street Crips originated in the 1970s and have been active for over three decades. 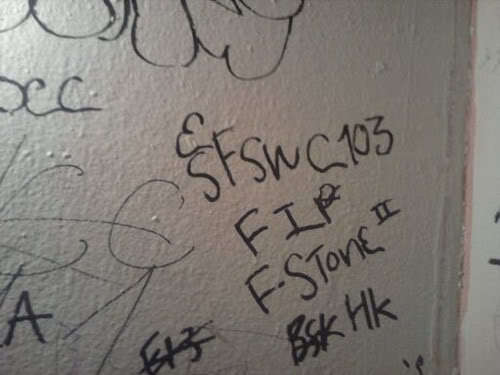 The Front Street Crips consist of several cliques such as 103rd Street, 104th Street, 105th Street, and 108th Street. They are known to sport Florida Marlins baseball cap with the logo letter of “F” to show affiliation to Front. They represent F Or Death, along with Fudge Town Mafia Crips and the Watts Franklin Square Crips as well as the Front Hood Compton Crips. The Front Street Crips are engaged in a bitter feud with the Bacc Street Crips, for over twenty-five years. This brutal rivalry has resulted in multiple gang-related drive-by shootings, and innocent people being caught in the crossfire. These two former allies, are sworn enemies with no hope of peace in sight. In the early/mid 1990s, the Front Street Crips had a short-lived feud with the PJ Watts Crips, when a reputable member of the Front Street Watts, “Baby Dre” was shot in the Imperial Courts, leaving him paralyzed. Allies include: East Coast Crips, Grape Street Watts Crips, Fudge Town Mafia Crips, PJ Watts Crips, Avalon Gangster Crips, Avalon Gardens Crips, and all Compton Crips. Rivals include: Back Street Crips (arch-enemy), Circle City Piru, Hacienda Village Bloods, Bounty Hunters Watts, Be-Bop Watts Bishop Bloods, South Los 13, and the Florencia 13.